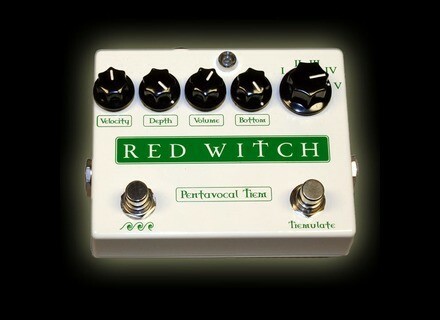 Pentavocal Trem, Tremolo pedal from Red Witch. Pierre-M's review (This content has been automatically translated from French)" Effectively complete discrete solid"
The pentavocal tremolo trem is a true analog bypass trs good quality, made in a secure box (signed by the technician on the part infrieure Checker! ), We feel that the one p dale of quality. There are also other typical functions, like the SETTING THE the depth is to say the rglage mix dry / wet (0 no effect, just the original sound), the velocity or the speed of the effect, and finally the volume button RULES output level of the pedals when it is engaged. It allows one to compensate the loss volume prompt is activated when the tremolo (tremolo problem making several other brands unusable ...), but also to use the pedals as BOOST. by lowering the depth and volume 0 background. Trs trs useful! Finally here are two to pentavocal own originality. It possdent bottom button that makes RULES allocation by the acute effect. And a note is more acute the less will be considered by the tremolo. It's kind of the depth SETTING THE according to the pitch of the note! Effective agreements, ca give a lot more air and clarity of your combos, useful also for solos. Last point: pentavocal means trem tremolo and five-way button switch found five positions. Each position possdent diffrent filters giving each position ca color and personality. We can get closer to a tremolo sound of an old fender or guard position with V the original sound. Personally, I t trsdcu by this function simply because it exists. I do not want to turn my sound with tremolo pedals! It made me think these horrors simulation Amp Line 6 "yes yes yes find the sound of your AC 30 amps!" which are only good for beginners playing in their room. In résumé functions trs compltes more than the majority of other tremolos, only that awful BMOL pentavocal function. Not as simple as that of home or mxr Fulltone simple but all the same. A small point ngatif anyway: the button velocity growth too fast to my taste fast tremolo. The pedals are true bypass so the original sound is not changed it's own. If your sound is round and warm when it come out round and warm the pedals. The effect is rather quiet, you will not break even hyper net square wave mode. We like it or not is tried and compared with other tremolos. In fact it is a rather typical vintage tremolo. I've had 6 months, never had a problem the pedals is solid. I love the building, transparency, and sound icroyable that gives you just tremolo! Ausi bottom function is very effective, and the volume knob that turns the pedals in boost. I dtest pentavocal function and I do not use it. I have tried many other models of the boss (blah blah blah), the Guyatone (unplayable), surfing the carl martin trem (very nice and clean, hlas too discreet), the pulsar EHX (complicated by the fact that one can choose between a gradual DIFFERENT types of waves), the TC electronic home that need to be aware that this is exactly the same cicuit than at T Rex (nice without), the mxr Stereo (super simple, super sound, but I did not need the function stro so it was a bit CHRE), the voodoo lab (very full possibilities boost too, but find fault in the sound is less transparent than the pentavocal, a little colder. 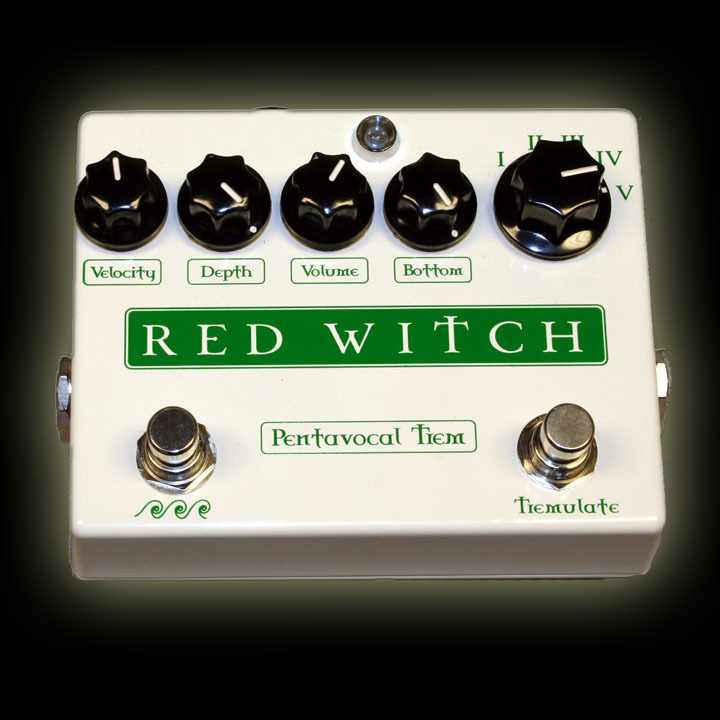 is better to buy a red witch opportunities that will be the same price as a lab vodoo nine) and finally the Fulltone supa trem tremolo is the last but absolutely priceless! The report quality price is right. Chopper of the occas' you play it safe, the pedals are sturdy.